Products: The (“Product(s)”) shall mean the Husky brand(s) products and related equipment and accessories listed on Schedule A hereto. Territory: The (“Territory”) shall mean the United States of America. End-User: An (“End-User”) shall mean any purchaser of the Product(s) from the Reseller who is the ultimate consumer for whom the Product is designed and who does not intend to resell the Product to a third party. Automotive Dealer: An ("Automotive Dealer") shall mean a purchaser of the Products from the Reseller who in turn resells automobiles and Products to End-Users. Transship: (“Transship”) shall mean the sale of Product(s) to any entity other than an End-User or Automotive Dealer. Appointment. For the Term of this Agreement, Husky appoints the Reseller through its agent a Husky authorized warehouse distributor as a non-exclusive authorized reseller of the Products to End-Users within the Territory. Internet Advertising and Sales. 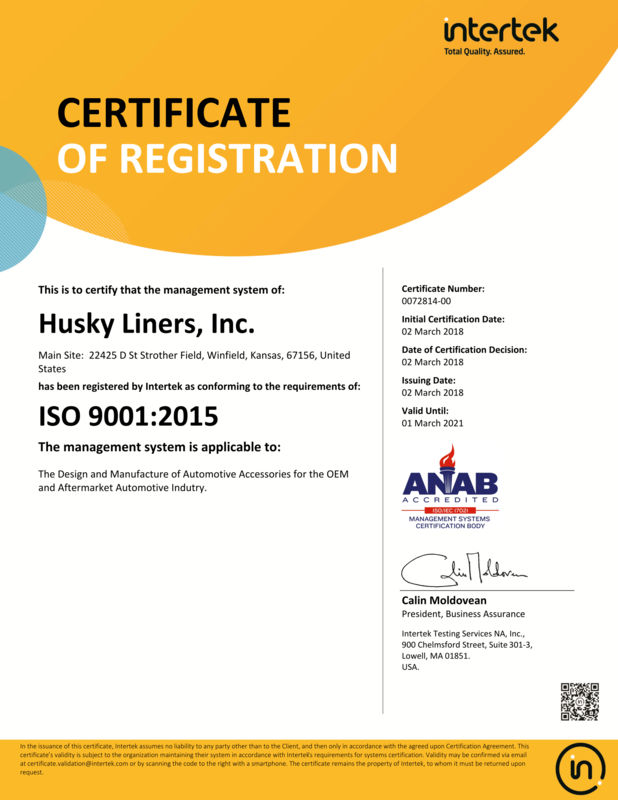 The Reseller is expressly prohibited from advertising for resale and/or selling Husky Liners products on the Internet. Resellers who wish to sell on the Internet must contact their sales repersentative to obtain information regarding how to apply to become approved for Internet Sales. Reseller shall not Transship the Products, specifically; it shall not sell or transfer any of the Products to any person or entity for resale other than an Automotive Dealer. Reseller shall not sell or offer for sale any product bearing a trademark, copyright, patent, or name associated with Husky, which Reseller purchased or obtained from a source other than directly from Husky. Reseller shall not obscure or alter in any fashion the serial number on any Product or its packaging. Liquidated Damages. For each occasion that Reseller breaches Section 3 of this Agreement by engaging in the unauthorized sale of Products, in addition to all other remedies available to Husky under this Agreement and at law, Reseller agrees to pay Husky, as liquidated damages and not as a penalty, the greater of the following amounts: (i) the costs and fees associated with Husky’s investigation and enforcement regarding the Reseller’s unauthorized sales; or (ii) five times (5X) the MSRP of the Product(s) per unit of Product. The parties agree that these damages are not punitive, that Husky’s damages due to the breach of Section 3 of the Agreement are difficult to quantify, and that these liquidated damages are a reasonable approximation of Husky’s damages in the event of a breach. Reseller may only sell and advertise for sale the Products within the Territory. Husky hereby expressly prohibits the Reseller from soliciting or consummating sales outside the Territory. Grant . Reseller is granted a limited, non-exclusive, non-transferable, revocable license to use the Licensed IP for the sole purpose of advertising and promoting the sale of Products within the Territory to End-Users. Reseller may not use the Licensed IP on the Internet (except to identify itself to consumers as an "Authorized Reseller of Husky Products," using the format provided or approved by Husky). Reseller shall ensure that the Licensed IP is: (a) used in conjunction with the ® or TM designations as directed by Husky; (b) not modified in any manner without the prior written consent of Husky; (c) used alone without any other terms, marks, or designs which may detract from the Licensed IP; and (d) displayed according to specifications which Husky may provide or amend from time to time. Reseller shall perform all acts requested by Husky to ensure that the nature and quality of Reseller's use of the Licensed IP is consistent with and does not detract from the goodwill associated with the Licensed IP. Reseller is specifically prohibited from registering or using any domain name containing any of Husky's trademarks. Reseller shall have no right, title, or interest in the Licensed IP. All use of the Licensed IP and the goodwill associated therewith shall inure to the benefit of Husky. Reseller shall not do anything inconsistent with Husky's ownership of the Licensed IP, including, but not limited to, using, causing or permitting another party to use the Licensed IP as any part of a uniform resource locator ("URL"), meta data tag, or as a keyword or search engine term. Reseller shall not, during the Term or thereafter, challenge the validity of the Licensed IP or Husky's title to or rights in the Licensed IP. Reseller shall not use the Licensed IP in a manner that disparages Husky or the Products, blurs, dilutes or otherwise diminishes the Licensed IP, or portrays Husky or the Products in a false, competitively adverse or poor light. Except for a sixty (60) day sell-through period from the date of termination of this Agreement, upon termination of this Agreement Reseller shall immediately discontinue and abandon its use of the Licensed IP, shall cease to advertise or represent itself as an authorized reseller, and shall cease to market, advertise, offer to sell, and/or sell the Products. Reseller must promptly return to Husky all Confidential Information (as defined in Section 19 below) including, but not limited to, all documents and information concerning prices, marketing, advertising and promotional activities. Reseller shall promptly inform Husky of any action or conduct of any person which may infringe upon any of Husky's intellectual property rights. Husky shall have the sole discretion whether to take legal action against any such infringement and any damages or other monies recovered on account of such infringement, whether by judgment, settlement or otherwise, shall belong exclusively to Husky. Reseller shall cooperate fully with Husky in connection with any legal action taken by Husky in connection with any such infringement. Reseller shall comply with the additional conditions regarding the use of Husky intellectual property described in Schedule B headed "Using Husky's Intellectual Property." conduct and maintain at all times its operation in compliance with all applicable Federal and State Laws and regulations, FTC consent orders, county and city ordinances and regulations and any other applicable law, regulation or ordinance. Reseller agrees not to engage in any unfair trade practices. Reseller shall indemnify and hold Husky harmless from any cost or liability, including costs of litigation and attorney's fees as may be incurred in defending any civil, criminal, or administrative action brought against Husky, its officers, employees, or agents of Husky that may result from a violation of this paragraph. Term. This Agreement shall begin on the Effective Date and, unless sooner terminated as provided herein, continue in full force and effect for one (1) year from the Effective Date (the “Initial Term”). This Agreement will automatically renew for consecutive one (1) year terms (“Renewal Term(s)”, and together with the Initial Term, the "Term"). by either party upon a continuing force majeure as set forth in Section 31 below. Liability & Obligations Upon Expiration/Termination. Neither Husky nor Reseller shall be liable to the other by reason of the expiration or termination of this Agreement, including, without limitation, liability based in law or in equity, compensation, reimbursement, or damages for present or prospective profits, or on account of investments, expenditures or commitments made by Reseller, or as a result of the establishment, development or maintenance of the goodwill of Husky, the Reseller or the Products. Any termination or expiration of this Agreement shall not relieve either party of any outstanding obligation or liability for Products sold or for any other matter or reason that accrued prior to the termination or expiration. Upon expiration or termination of this Agreement, Reseller shall immediately cease to represent itself as an authorized reseller of Husky Products, cease all use of Husky's intellectual property, and return to Husky all advertising, promotional, display and other materials that have been furnished to Reseller by Husky. The acceptance by Husky of a Reseller purchase order after the expiration or termination of this Agreement shall not be deemed a renewal or extension of this Agreement, or a waiver of its termination or expiration or a waiver of any prior breach. However, Husky shall be under no obligation to fulfill any orders by Reseller after Termination. Except as otherwise set forth in Section 10(b) of this Agreement, this Agreement may be amended, waived, or modified only by a written instrument signed by an authorized officer of both parties stating specifically that it is an amendment, waiver, or modification. No waiver of any provision at any particular time shall be deemed a permanent waiver of such provision, or a waiver of any other provision of this Agreement. Failure to enforce a provision shall not be deemed a waiver. Husky may amend or modify any Schedule in this Agreement by providing notice to the Reseller, and any such amendment or modification shall become effective immediately upon delivery of such notice. In the event that any Product is found by Husky, Reseller, or any governmental agency or court having jurisdiction over such Product to contain a Safety Hazard or other Defect or condition that requires or would make advisable a rework or recall of such Product, such party shall promptly communicate all relevant facts to the other party. Husky shall promptly undertake all corrective actions, including those required to meet all obligations imposed by laws, regulations, or orders, and shall file all necessary papers, corrective action programs, and other related documents required under applicable law or regulation; provided that Reseller shall reasonably cooperate with and assist Husky in any such filing and correction action, at Husky’s expense; and, provided further, that nothing in this section shall preclude Reseller from taking such action as may be required of it under any applicable law or regulation or business purpose. Husky shall perform all necessary repairs or modifications to the Product at its sole expense. The parties recognize that it is possible that other Husky-manufactured products might contain the same Safety Hazard, Defect, or other condition described in the preceding paragraph. Reseller and Husky agree that any recall involving any Product purchased by Reseller shall be treated separately and distinctly from similar results of Husky’s brand products, provided that such separate and distinct treatment is lawful and that Husky shall in no event fail to provide at least the same protection to Reseller with regard to such Product as Husky provides to its other customers in connection with a recall of such Product or other Husky products. Each party shall consult the other prior to making any statements to the public or a governmental agency concerning issues relating to any product recall of a Product, except where such consultation would prevent timely notification required to be given under any such law or regulation. Entire Agreement. This Agreement, the attached Schedules, any additional terms and conditions mutually agreed upon in writing by the parties, Husky’s written invoices, and any and all personal guarantees or assurances of payment set forth in Reseller’s New Account Application set forth the entire understanding and agreement of the parties, and supersede any and all oral or written agreements or understandings between the parties as to the subject matter of this Agreement. The parties hereby acknowledge and represent, by execution hereof, that said parties have not relied on any representation, assertion, guarantee, warranty, collateral contract or other assurance, except those set out in this Agreement, made by or on behalf of any other party or any other person or entity whatsoever, prior to the execution of this Agreement. The parties hereby waive all rights and remedies, at law or in equity, arising or which may arise as the result of a party’s reliance on such representation, assertion, guarantee, warranty, collateral contract or other assurance, provided that nothing herein contained shall be construed as a restriction or limitation of said party’s right to remedies associated with the gross negligence, willful misconduct or fraud of any person or party taking place prior to, or contemporaneously with, the execution of this Agreement. Repurchase Option. Within ten (10) days of termination of this Agreement for any reason, Reseller agrees to provide Husky with a list of its inventory of the Products. Husky, at its option, will have the right to repurchase from Reseller any or all saleable Products in Reseller’s inventory by sending written notice of the exercise of such option within thirty (30) days from the effective date of expiration or termination or the date Husky receives the foregoing list, whichever last occurs. The purchase price of such Products will be at the net invoice prices at which the Products were originally purchased by Reseller, less any discounts or allowances that Husky may have given Reseller on account of such Products. If such option to repurchase is exercised by Husky, Reseller agrees, at Reseller’s expense to deliver to Husky Reseller’s inventory of the Products in their original packages within thirty (30) days of receipt of Husky’s notice of exercise. Changes by Husky. Husky reserves the right at any time to discontinue the production, sale or distribution of any of its Products, to change the design of its Products and any parts thereof, and to change its service, warranty, price, or other policies, without advance notice or obligation to the Reseller of any kind whatsoever. Reseller agrees that it shall have no claim against Husky or any of its agents or affiliates for failure to furnish such Products, whether or not such Products are of a model, design or type previously sold. Minimum Advertised Price Policy. Reseller acknowledges that Reseller has been informed of Husky’s Minimum Advertised Price Policy as it applies to the advertisement for sale of Husky Products from Resellers to End-Users in the United States. There is no agreement, express or implied, between Husky and Reseller with respect to the advertised or resale pricing of Products. Law and Forum. This Agreement shall be deemed to have been entered into and fully performed in the State of Kansas and shall be governed by and construed in accordance with the laws of the State of Kansas without regard for the conflicts of laws rules thereof. Reseller agrees that all controversies, disputes and claims arising out of this Agreement shall be adjudicated exclusively by a court of competent jurisdiction within the county of Cowley, State of Kansas or the United States District Court in the District of Kansas, except that any judgment in any such action may be enforced in other jurisdictions by suit or in any other permitted manner. Reseller irrevocably consents to the jurisdiction and venue of the state and federal courts of Kansas and waives any rights to seek a transfer of venue for any reason or to claim that the forum is inconvenient. EXCLUDING THIRD PARTY PRODUCT LIABILITY CLAIMS AND THIRD PARTY INTELLECTUAL PROPERTY INDEMNIFICATION CLAIMS, HUSKY’S TOTAL LIABILITY IN CONTRACT, TORT OR OTHERWISE SHALL BE LIMITED TO THE PURCHASE PRICE OF THE PRODUCTS PAID BY RESELLER IN AGGREGATE DURING THE TWELVE (12) MONTHS PRIOR TO THE EVENT CAUSING THE LIABILITY. IN NO EVENT SHALL HUSKY BE LIABLE TO RESELLER IN CONTRACT, TORT OR OTHERWISE (INCLUDING NEGLIGENCE) FOR ANY INDIRECT, INCIDENTAL, COLLATERAL, CONSEQUENTIAL, EXEMPLARY PUNITIVE OR SPECIAL DAMAGES, INCLUDING LOSS OF PRODUCTION, LOSS OF PROFITS OR SAVINGS, LOSS OF REVENUE, LOSS OF USE OF REVENUE, LOSS OF USE OF THE PRODUCTS, LOSS OF TIME, DAMAGE TO PROPERTY CAUSED BY THE PRODUCTS, INCONVENIENCE, AND OTHER CONSEQUENTIAL ECONOMIC LOSS EVEN IF HUSKY HAS BEEN ADVISED OF THE POSSIBILITY OF SUCH DAMAGES. NOTWITHSTANDING ANY OTHER PROVISION OF THIS AGREEMENT OR OF ANY OTHER CONTRACT, THIS PROVISION SHALL APPLY TO THE FULLEST EXTENT PERMITTED BY LAW REGARDLESS OF FAULT. HUSKY DISCLAIMS ALL WARRANTIES, EXPRESS OR IMPLIED, WITH REGARD TO HUSKY PRODUCTS SOLD TO THE RESELLER, INCLUDING WARRANTIES OF MERCHANTABILITY AND FITNESS FOR A PARTICULAR PURPOSE. Husky shall defend, indemnify and hold harmless Reseller from and against any and all third party claims and liabilities, arising out of or in connection with a claim that any Product, when used within the scope intended, infringes, violates or misappropriates a valid third party patent or copyright existing on the date of this Agreement. Husky shall have no obligation to the Reseller or to any other party with respect to any action or claim of infringement based upon or arising out of the use of any Product, or any part thereof if the Product has been used: (i) in a manner for which it was not intended; (ii) in a modified form without the express written permission of Husky; or (iii) in combination with any other system, equipment or devices not contemplated by the applicable model specifications; or if the Products have been refurbished. Reseller shall not be entitled to indemnification by Husky for Product infringement unless Reseller: (i) gives Husky prompt written notice of any action or threat of action, the ground for such action and all prior claims relating to any actual or threatened action; (ii) acknowledges in writing that Husky will have the sole control of the defense of the action and all negotiations for its settlement or compromise and (iii) fully and completely cooperates with Husky in all reasonable respects (and at Husky’s cost and expense) in its defense of the action and all negotiations for its settlement or compromise to third parties. The foregoing indemnification shall not apply to any claim of patent or copyright infringement based upon the use of any part, component or other device furnished or supplied by Reseller. If any Product, or any part thereof, supplied by Husky hereunder, becomes, or in Husky’s opinion is likely to become, the subject of a claim of infringement of a United States or foreign patent, trademark or copyright, Reseller shall permit Husky, in Husky’s sole discretion and at Husky’s sole expense (i) to procure for Reseller the right to continue using and selling the Product upon terms and conditions satisfactory to Husky and the third party claimant, or (ii) to replace or modify the Product so that it becomes non-infringing. Confidentiality. In connection with the business relationship contemplated by this Agreement, each party may receive or have access to commercially valuable technical and non-technical confidential or proprietary information of the other party, including information in whatever form, relating to the business of such party that is not generally known or available to others, including new product styles and designs, trade secrets, pricing strategies, marketing, business plans, and any logins and passwords provided by Husky (the “Confidential Information”). Each party acknowledges and agrees that any Confidential Information received or obtained from the other party will be the sole and exclusive property of the other party and may not be used, disseminated or disclosed except as may be necessary to perform the obligations required under this Agreement or as may be required by law. If disclosure is required by law, the party required to disclose Confidential Information shall reasonably cooperate with the other party (at the other party’s request and expense) so that the other party may preserve the confidentiality of the Confidential Information. Notwithstanding the foregoing, Confidential Information shall not include, and neither party will be liable for disclosure of, any information received by the receiving party under this Agreement if the information: (a) is or becomes generally available to or known to the public through no wrongful act of the receiving party; (b) was previously known by the receiving party through no wrongful act of the receiving party; (c) was independently developed by the receiving party without reference to the Confidential Information; or (d) was lawfully disclosed to the receiving party by a third party under no obligation of confidentiality to the other party. Assignment. This Agreement shall not be transferred or assigned by Reseller, in whole or in part, nor shall Reseller delegate or sublicense any of its rights or obligations hereunder without the prior written consent of Husky. Any change in ownership of Reseller whether through the sale of its stock, a merger, reorganization, or sale of its assets, in a single transaction or a series of related transactions, shall be deemed a transfer entitling Husky to terminate this Agreement without notice. Remedies. Because the damages associated with any breach of this Agreement would be difficult, if not impossible to ascertain, Husky shall have the right to seek immediate injunctive relief (including but not limited to a temporary restraining order, preliminary and/or permanent injunctive relief) against Reseller for any such breach without having to provide notice to Reseller or to post a bond. Husky’s right to injunctive relief shall be in addition to and not in lieu of its right to obtain any other damages. Reseller hereby waives its right to an injunction to allow it to continue marketing, advertising, offering for sale, and/or selling Products or to use the Licensed IP once this Agreement has been terminated for any reason. In the event of non-payment by Reseller, the Reseller shall be responsible for Husky’s attorneys’ fees and costs associated with any lawsuit or other action necessary to obtain full payment. Notwithstanding any statutory provision to the contrary, the Reseller must bring any alleged claims against Husky arising under this Agreement or its termination within one hundred eighty (180) days of the claim arising or any such claim shall be waived. Ineffectiveness Clause. Should a provision in this Agreement be or become ineffective, the effectiveness of all other terms shall not thereby be affected. Ineffective terms shall be replaced by legally valid provisions, which best reflect the requisite commercial intent of the parties. Captions. Titles or captions contained in this Agreement are inserted only for convenient reference, and in no way define, limit or describe the scope or intent of this Agreement or any provision hereof. Independent Entities; No Franchise Relationship. Nothing contained herein shall affect, modify or change the fact that Husky and Reseller are separate legal entities and are not representatives or agents of each other. Reseller specifically acknowledges that this Agreement does not create any agency or franchise relationship and that no direct or indirect fee has been paid by Reseller in connection with the establishment of this buyer/seller relationship. This Agreement does not create a joint venture, partnership and/or agency relationship. Husky shall bear no responsibility, directly or indirectly, for the Retail Locations or for the transactions made through said Retail Locations. Release and Limitations on Future Claims. In consideration of the mutual execution of this Agreement, the Reseller agrees to hereby release Husky from all manner of action and actions, cause and causes of action, suits, contracts, controversies, damages, claims and demands whatsoever, known or unknown, in law or in equity, whether under laws and regulations of federal, state or municipal governments, under the common law or otherwise, which Reseller or its respective successors or assigns ever had, now have or which they or any of them hereafter can, shall or may have against Husky by reason of any matter, cause or thing whatsoever from the beginning of time until the Effective Date hereof. Survival. The following sections of this Agreement shall survive the expiration and termination of this Agreement; 3(a), 4(a), 5, 9, 11, 17, 18 and 19. Notices. Notices under this Agreement shall be in writing and shall be deemed given on the day of any email transmission or three (3) days after mailing. Counterparts. This Agreement may be executed in counterparts, each of which shall be deemed an original, but all of which shall constitute one and the same instrument. Force Majeure. Neither Husky nor Reseller shall be held liable or in default for failure of performance for any cause beyond their reasonable control such as, for example, acts of God, declared or undeclared war, fire, flood, interruption of transportation, embargo, insurrections, accident, explosion, governmental orders, regulations, restrictions, priorities or rationing, any strike, lockout or other labor troubles interfering with the production or transportation of the Products or interference with the supply of raw materials for production of the Products. If the force majeure in question prevails for a continuous period in excess of three (3) months, either party shall be entitled to give notice in writing to the other party to terminate this Agreement, specifying the termination date, which must not be less than fifteen (15) days after the date on which the notice to terminate is given. Once a notice to terminate has been validly given, this Agreement shall terminate on the termination date set out in such notice. Electronic Execution. In accordance with the federal Electronic Signatures in Global and National Commerce Act, 15 U.S.C. Section 7001 et seq. (“ESIGN”) and the California Uniform Electronic Transactions Act, Cal. Civ. Code §§ 1633.1 – 1633.17 (“UETA”), the parties hereby agree to execute this Agreement using electronic means including the use of electronic signatures by the parties, which the parties agree shall have the full force and legal effect as if the electronic signatures were traditional hand-written signatures. The Dealer acknowledges that it has the ability to retain this Agreement either by printing or saving it. Each signatory agrees that he or she has been authorized and has the authority to enter into the Agreement with an electronic signature on behalf of the applicable party and intends to sign this Agreement by applying his or her electronic signature as indicated. As a Husky Authorized Reseller, you will benefit from the fame and inherent value signified by the Husky brand name and our various product trademarks. In addition to being under agreement to use Husky trademarks properly, it is in your best interest to assist in protecting the Husky marks by using them properly in all advertising and promotional materials. Reseller shall not use or register any Internet domain name containing any intellectual property, and shall submit to Husky for approval in advance true and complete copies of all World Wide Web pages which contain or refer to any intellectual property owned by Husky, and shall not use such intellectual property on its website without such prior approval. Reseller shall not, without express written permission from Husky purchase Husky’s intellectual property through Google’s and Yahoo’s Adwords programs and/or other web service providers’ similar programs. The marks must be reproduced exactly from camera ready artwork provided by Husky. If the Husky logo appears on the Reseller’s stationery or business cards, the words “Authorized Reseller” must follow it. This can be accomplished by using the “Husky Authorized Reseller” artwork provided by Husky. There must be no confusion with which entity the customer is dealing. The Reseller’s name must be the most prominent name on the page. The Husky logo may not be the only source identifier on the page. The Husky logo trademark may not appear at the top of the page. The Husky logo trademark must not be used in combination with another company mark in such a manner that the marks appear to be joined or associated in any way. Ample space must appear between the two marks to distinguish them as separate entities. The Husky logo trademark or any Husky product mark may not be used in a way that will dilute or diminish its value to Husky, such as on others’ goods or in any non-approved form. Any use of any Husky mark on a web page must adhere to these guidelines. A superscript indicating a registered trademark (®) or trademark (™) or service mark (SM) symbol must appear next to all marks in all printed literature. The registered trademark (®) or trademark (™) or service mark (SM) symbol must appear as a superscript following the appropriate mark on the first most prominent use on each page of a piece. All marks must be capitalized, italicized, or bolded or otherwise treated with prominence. Any use of a Husky trademark which is not addressed in the guidelines set forth herein, must be approved by Husky prior to its use. Submittals for approval should be emailed to the attention of your Husky representative. Territory: The (“Territory”) shall mean Canada. Internet Advertising and Sales. The Reseller is expressly prohibited from advertising for resale and/or selling the Products on the Internet. The parties hereto confirm that it is their wish that this Agreement as well as all other documents relating hereto, including notices, have been and shall be drawn up in the English language only. Les parties aux presént confer ment leur volonté que cette convention de même que tous les documents, y compris tous avis, s’y rattachent, soient rédigés en anglais seulement. Electronic Execution. In accordance with the federal Personal Information Protection and Electronic Documents Act S.C. 2000, c. 5 (“PIPEDA”), An Act to Establish a Legal Framework For Information Technology R.S.Q., chapter C-1.1 (the “Quebec Act”) and each applicable province’s adoption of the Canadian Uniform Electronic Commerce Act (“UECA”), the parties hereby agree to execute this Agreement using electronic means including the use of electronic signatures by the parties, which the parties agree shall have the full force and legal effect as if the electronic signatures were traditional hand-written signatures. Dealer acknowledges that it has the ability to retain this Agreement either by printing or saving it. Produits: Le ("produit (s)") désigne les marque Husky (s) produits et d'équipements et accessoires connexes énumérés à l'annexe A ci-jointe. Territoire: Le ("Territoire") désigne le Canada. End-User: Un ("End-User") désigne tout acheteur du produit (s) du revendeur qui est le consommateur final pour laquelle le produit est conçu et qui n'a pas l'intention de revendre le produit à un tiers. Concessionnaire automobile: Un («Concessionnaire automobile») désigne un acheteur des produits auprès du revendeur qui à son tour revend voitures et produits aux utilisateurs finaux. Transborder: ("transborder") désigne la vente de produit (s) à toute entité autre que l'utilisateur final ou revendeur automobile. Pour la durée du présent Accord, Husky nomme le revendeur entremise de son agent un Husky distributeur agréé d'entrepôt comme un revendeur autorisé non exclusive des produits aux utilisateurs finaux dans le territoire. Internet publicité et des ventes.Le revendeur est expressément interdit à la publicité pour la revente et / ou la vente des produits sur Internet. Revendeur ne doit pas Transbordent les produits, en particulier; ne pas vendre ou transférer des produits à toute personne ou entité pour la revente autre qu'un concessionnaire automobile.Revendeur ne doit pas vendre ou offrir en vente tout produit portant une marque de commerce, droit d'auteur, brevet, ou le nom associé à Husky, qui revendeur acheté ou obtenu à partir d'une source autre que directement à partir de Husky. Revendeur ne doit pas obscurcir ou de modifier de quelque façon que le numéro de série sur un produit ou sur son emballage. Dommages liquidés.Pour chaque occasion que revendeur contrevient à l'article 3 du présent Accord en se livrant à la vente non autorisée de produits, en plus de tous les autres recours disponibles pour Husky vertu du présent Accord et à la loi, revendeur accepte de payer Husky, à titre de dommages et non pas comme une sanction , le plus élevé des montants suivants: (i) les coûts et les frais associés à l'enquête et de l'application de Husky concernant les ventes non autorisées du Revendeur; ou (ii) cinq fois (5x) le PDSF du Produit (s) par unité de produit.Les parties conviennent que ces dommages ne sont pas punitive, que les dommages-intérêts de Husky en raison de la violation de l'article 3 de l'accord sont difficiles à quantifier, et que ces dommages-intérêts sont une approximation raisonnable des dommages-intérêts de Husky dans le cas de violation. Revendeur ne peut vendre et publicité pour la vente des produits dans le territoire.Husky interdit expressément le Revendeur de solliciter ou consommer des ventes en dehors du territoire. Revendeur est accordée une, non-cessible et révocable, limitée, non exclusive, d'utiliser la licence IP dans le seul but de la publicité et de la promotion de la vente de produits dans le territoire à des utilisateurs finaux. Revendeur ne peut pas utiliser la licence IP sur Internet (sauf pour se identifier pour les consommateurs comme un «revendeur agréé de produits Husky», en utilisant le format fourni ou approuvé par Husky). Le revendeur doit veiller à ce que l'adresse IP est sous licence: (a) est utilisé en conjonction avec les désignations ® ou MD comme dirigé par Husky; (b) de ne pas modifiée d'une manière sans le consentement écrit préalable de Husky; (c) utilisé seul sans aucun autre termes, des marques ou des modèles qui peuvent nuire à la licence IP; et (d) affiche selon les spécifications qui Husky peut fournir ou modifier de temps en temps. Le revendeur doit accomplir tous les actes demandés par Husky pour assurer que la nature et la qualité de l'utilisation de revendeur de la licence IP est conforme et ne nuisent pas à la bonne volonté associée à l'IP sous licence. Revendeur est expressément interdit d'enregistrer ou d'utiliser tout nom de domaine contenant l'un des marques de commerce de Husky. Revendeur doit avoir aucun droit, titre ou intérêt dans la propriété intellectuelle sous licence. Toute utilisation de la licence IP et le goodwill associé est en vigueur au bénéfice de Husky.Revendeur ne doit pas faire quoi que ce soit incompatible avec la propriété de Husky de la licence IP, y compris, mais sans s'y limiter, en utilisant, causer ou de permettre une autre partie à utiliser la licence IP comme une partie d'un localisateur de ressource uniforme ("URL"), balise méta-données ou comme un terme moteur de recherche mot-clé ou. Revendeur ne doit pas, pendant la durée ou par la suite, contester la validité de l'adresse IP sous licence ou le titre ou les droits de Husky dans la licence IP. Revendeur ne doit pas utiliser la licence IP d'une manière qui dénigre Husky ou les produits, brouille, dilue ou autrement diminue la licence IP, ou dépeint Husky ou les produits dans une lumière fausse, compétitive défavorable ou pauvres. Sauf pour une période de vente à travers les soixante (60) jours de la date de résiliation du présent Accord, à la fin de ce revendeur Accord immédiatement cesser et renoncer à son utilisation de la licence IP, cesse d'annoncer ou de se représenter comme un revendeur autorisé , et cesse de marché, de la publicité, offrir à la vente, et / ou vendre les produits.Revendeur doit retourner rapidement à Husky toute l'information confidentielle (tel que défini à l'article 19 ci-dessous), y compris, mais sans s'y limiter, tous les documents et informations concernant les prix, le marketing, la publicité et les activités promotionnelles. Revendeur informe sans délai Husky de toute action ou comportement de toute personne qui peut porter atteinte à aucun des droits de propriété intellectuelle de Husky.Husky aura l'entière discrétion l'opportunité de prendre une action en justice contre une telle infraction et des dommages-intérêts ou d'autres sommes d'argent récupéré en raison de cette violation, que ce soit par jugement, une transaction ou autrement, appartiennent exclusivement à Husky. Le revendeur doit coopérer pleinement avec Husky dans le cadre de toute action en justice intentée par Husky en relation avec une telle violation. Revendeur doit respecter les conditions supplémentaires concernant l'utilisation de la propriété intellectuelle Husky décrit à l'annexe B intitulée «Utilisation de la propriété intellectuelle de Husky." mener et de maintenir en tout temps son fonctionnement en conformité avec tous les fédéral et de l'Etat lois et règlements, les ordonnances de consentement de la FTC, comté et la ville ordonnances et règlements applicables et toute autre loi applicable, règlement ou ordonnance.Revendeur accepte de ne pas se livrer à des pratiques commerciales déloyales. Revendeur indemnisera et Husky indemne de tout coût ou la responsabilité, y compris les frais de litige et les honoraires d'avocat qui peuvent être engagés dans la défense de toute action civile, pénale ou administrative intentée contre Husky, ses dirigeants, employés ou agents de Husky qui peuvent résulter d'une violation du présent paragraphe. Le présent Accord commencera à la date d'entrée en vigueur et, sauf résiliation comme prévu aux présentes, restera en vigueur et de plein effet pour un (1) an à compter de la date d'entrée en vigueur (la "période initiale"). Le présent Accord sera automatiquement renouvelé pour une mandats consécutifs (1) année («Période de renouvellement (s)", et avec la durée initiale, la «durée»). par les deux parties sur un cas de force majeure continue comme indiqué à l'article 31 ci-dessous. Responsabilité et obligations à l'expiration / résiliation.Ni Husky ni revendeur ne sera responsable à l'autre en raison de l'expiration ou la résiliation du présent Accord, y compris, sans limitation, la responsabilité fondée en droit ou en équité, la compensation, le remboursement ou des dommages-intérêts pour les profits présents ou futurs, ou en raison de les investissements, les dépenses ou les engagements pris par le Revendeur, ou à la suite de la création, le développement ou le maintien de la bonne volonté de Husky, le revendeur ou les produits. Toute résiliation ou l'expiration du présent Accord ne dispensent pas l'autre partie de toute obligation ou responsabilité exceptionnelle pour les produits vendus ou pour toute autre question ou la raison qui se sont accumulés avant la résiliation ou l'expiration. À l'expiration ou la résiliation du présent Accord, revendeur doit immédiatement cesser de se représenter comme un revendeur autorisé de Husky produits, de cesser toute utilisation de la propriété intellectuelle de Husky, et revenir à Husky toute publicité, de promotion, d'affichage et d'autres matériaux qui ont été fournis à Revendeur par Husky. L'acceptation par Husky d'un ordre d'achat Revendeur après l'expiration ou la résiliation du présent accord ne doit pas être considéré comme un renouvellement ou la prolongation du présent Accord, ou d'une renonciation à sa résiliation ou à l'expiration ou à une renonciation de toute infraction antérieure. Cependant, Husky sera sous aucune obligation de remplir toutes les commandes par le Revendeur après la résiliation. Sauf disposition contraire énoncée à l'article 10 (b) du présent Accord, le présent Accord peut être modifié, supprimé, ou modifiée que par un document écrit signé par un agent autorisé des deux parties indiquant expressément qu'il est une modification, renonciation ou modification .Aucune renonciation de toute disposition à un moment donné doit être considéré comme une renonciation permanente d'une telle disposition ou une renonciation à toute autre disposition du présent Accord. Inexécution d'une disposition ne peut être considéré comme une renonciation. Husky peut amender ou de modifier toute annexe au présent Accord en donnant un préavis au revendeur, et toute modification ou la modification prendra effet immédiatement après la livraison d'un tel avis. Dans le cas où un produit est trouvé par Husky, revendeur, ou tout gouvernementale organisme ou un tribunal ayant compétence sur tel produit à contenir un risque pour la sécurité ou autre défaut ou une condition qui exige ou ferait une reprise ou le rappel d'un tel produit conseillé, cette partie communique sans tarder tous les faits pertinents à l'autre partie.Husky doit entreprendre rapidement toutes les actions correctives, y compris celles requises pour répondre à toutes les obligations imposées par les lois, règlements ou ordonnances, et doit déposer tous les documents nécessaires, les programmes de mesures correctives et d'autres documents connexes requis en vertu de la loi ou la réglementation applicable; à condition que Revendeur doit raisonnablement coopérer avec et aider Husky dans tout dépôt et de correction telle action, à la charge de Husky; et, en outre, que rien dans cet article ne fait obstacle Revendeur de prendre les mesures qui peuvent être requis de lui en vertu de toute loi ou réglementation applicable ou de l'objectif commercial. Husky doit effectuer toutes les réparations ou modifications nécessaires au produit à ses frais. Les parties reconnaissent qu'il est possible que d'autres produits Husky-manufacturés pourraient contenir le même risque pour la sécurité, des défauts, ou d'autres conditions décrites dans le paragraphe précédent.Revendeur et Husky conviennent que tout rappel impliquant un produit acheté par le Revendeur doit être traitée séparément et distinctement des résultats similaires de produits de la marque de Husky, à condition que ce traitement séparé et distinct soit licite et que Husky doit en aucun cas manquer de fournir au moins le même la protection de revendeur à l'égard de tels produits comme Husky fournit à ses autres clients dans le cadre d'un rappel de ce produit ou d'autres produits Husky. Chaque partie consulte l'autre avant de faire des déclarations au public ou un organisme gouvernemental concernant les questions relatives à tout rappel de produit d'un produit, sauf si une telle consultation permettrait d'éviter la notification rapide qui doit être donné en vertu d'une telle loi ou d'un règlement. Intégralité de l'accord.Le présent Accord, les annexes ci-jointes, les termes et conditions supplémentaires convenus par écrit par les parties, les factures écrites de Husky, et tout et toutes les garanties personnelles ou des garanties de paiement énoncées dans la demande Nouveau compte du revendeur selon l'intégralité de l'accord de les parties, et remplacent tous les accords ou ententes écrites ou orales entre les parties quant à l'objet du présent Accord. Les parties aux présentes reconnaissent et représentent, par l'exécution des présentes, que lesdites parties ont invoqué aucune représentation, affirmation, garantie, garantie, le contrat de garantie ou autre assurance, sauf celles qui sont énoncées dans le présent Accord, fait par ou au nom de toute autre partie ou toute autre personne ou entité que ce soit, avant l'exécution du présent Accord. Les parties renoncent à tous les droits et recours, en droit ou en équité, découlant ou qui peuvent survenir à la suite de la dépendance d'une partie sur une telle représentation, affirmation, garantie, garantie, le contrat de garantie ou autre assurance, à condition que rien de contenu doit être interprété comme une restriction ou une limitation du droit de ladite partie à des recours liés à la négligence grave, une faute intentionnelle ou d'une fraude de toute personne ou partie qui se déroule avant, ou en même temps, l'exécution du présent Accord. Option de rachat.Dans les dix (10) jours de la résiliation du présent Accord pour une raison quelconque, le Revendeur accepte de fournir Husky avec une liste de son inventaire des produits. Husky, à sa discrétion, aura le droit de racheter à Reseller tout ou partie des produits vendables dans l'inventaire de revendeur en envoyant un avis écrit de l'exercice de cette option dans les trente (30) jours à compter de la date d'effet de l'expiration ou la résiliation ou la date Husky reçoit la liste de ce qui précède, selon la dernière. Le prix d'achat de ces produits seront à des prix nets facturés au cours de laquelle les produits ont été achetés par le Revendeur, déduction faite des remises ou des allocations que Husky a peut-être donné Revendeur à cause de ces produits. Si une telle option de rachat est exercé par Husky, Revendeur accepte, à la charge du revendeur de livrer à l'inventaire de Husky revendeur des produits dans leurs emballages d'origine dans les trente (30) jours suivant la réception de l'avis de Husky de l'exercice. Changement dans la propriété.Si les transferts Revendeur ou aliène la totalité ou la quasi-totalité de son activité et / ou les magasins au détail par le biais d'une vente d'actifs ou d'actions, ou par une fusion ou une opération semblable, ou si revendeur est une entreprise privée et il est un changement dans la haute direction, ce contrat prend fin immédiatement et sans préavis. Le nouveau propriétaire (s) ou gérant (s) du revendeur doivent avoir aucun droit en vertu du présent accord et ne sont pas le marché, de la publicité, et / ou d'offrir en vente des produits jusqu'à ce que et à moins que ce nouveau propriétaire (s) ou gérant (s) appliquer d'abord à et devenir autorisé par Husky comme un «revendeur agréé." Changements par Husky.Husky se réserve le droit à tout moment de mettre fin à la production, la vente ou la distribution d'un de ses produits, de modifier la conception de ses produits et toutes les parties de ceux-ci, et de changer son service, la garantie, le prix, ou d'autres politiques, sans préavis ou l'obligation de le Revendeur de quelque nature que ce soit.Revendeur convient qu'il ne possède aucune réclamation contre Husky ou l'un de ses agents ou affiliés pour défaut de fournir ces produits, qu'ils soient ou non ces produits sont d'un modèle, la conception ou de type précédemment vendus. Politique unilatérale.Revendeur reconnaît que revendeur a été informé de la politique unilatérale d'Husky comme il applique à la publicité pour la vente de produits Husky auprès de revendeurs à des utilisateurs finaux au Canada. Il n'y a pas d'accord, explicite ou implicite, entre Husky et Revendeur par rapport au prix annoncé ou la revente des produits. Si tout administrateur, dirigeant, employé, un représentant ou un autre agent de Husky essaie de contraindre les revendeurs à accepter le prix auquel revendeur annonce ou revend Husky produits, une telle action doit être considérée comme nulle, non autorisé, et sans effet et Revendeur avise promptement Le coordonnateur de la politique de Husky à upcoordinator@huskyliners.com. Droit et Forum.Le présent Accord sera réputé avoir été conclu et entièrement réalisée dans l'État du Kansas et seront régis et interprétés conformément aux lois de l'État du Kansas, sans égard pour les règles de conflits de lois de ceux-ci. Revendeur accepte que toutes les controverses, les litiges et les réclamations découlant du présent Accord doivent être jugées exclusivement par un tribunal de juridiction compétente dans le comté de Cowley, État du Kansas ou de la Cour de district des États-Unis dans le district du Kansas, sauf que tout jugement une telle action peut être exécutée dans d'autres juridictions en costume ou de toute autre manière autorisée. Revendeur consent irrévocablement à la compétence et de lieu des tribunaux d'État et fédéraux du Kansas et renonce à tout droit de demander un transfert de lieu pour une raison quelconque ou de prétendre que le forum est gênant. EXCLUSION réclamations de tiers en responsabilité de produit et le tiers PROPRIÉTÉ INTELLECTUELLE INDEMNISATION DES REVENDICATIONS, la responsabilité totale de Husky EN CONTRAT, UN TORT OU AUTRE EST LIMITEE AU PRIX D'ACHAT DES PRODUITS EN CHARGE PAR REVENDEUR total au cours des douze (12) mois avant l'événement entraînant LA RESPONSABILITÉ. EN AUCUN CAS Husky SERA RESPONSABLE ENVERS revendeur dans CONTRAT, UN TORT OU AUTRE (Y COMPRIS LA NÉGLIGENCE) POUR DOMMAGES INDIRECTS, ACCESSOIRES, Collateral, INDIRECTS, EXEMPLAIRES EXEMPLAIRES OU DOMMAGES SPECIAUX, Y COMPRIS LA PERTE DE PRODUCTION, PERTE DE PROFITS OU D'ÉCONOMIES, PERTE DE REVENUS, PERTE D'UTILISATION DE REVENUS, LA PERTE D'UTILISATION DES PRODUITS, LA PERTE DE TEMPS, LES DOMMAGES AUX BIENS CAUSES PAR LES PRODUITS, les inconvénients et les pertes économiques indirectes AUTRES MEME SI HUSKY A ÉTÉ AVERTI DE LA POSSIBILITÉ DE TELS DOMMAGES. NONOBSTANT TOUTE AUTRE DISPOSITION DU PRÉSENT CONTRAT OU DE TOUTE AUTRE CONTRAT, cette disposition sera applicable DANS LES LIMITES PRÉVUES PAR LA LOI indépendamment de la faute. HUSKY EXCLUT TOUTE GARANTIE, EXPLICITE OU IMPLICITE, EN CE QUI CONCERNE LES PRODUITS VENDUS HUSKY au revendeur Y COMPRIS LES GARANTIES DE QUALITÉ MARCHANDE ET D'ADAPTATION À UN USAGE PARTICULIER. Husky doit défendre, indemniser et revendeur de et contre toutes les réclamations et les passifs de tiers, découlant de ou en relation avec une demande que tout produit, lorsqu'il est utilisé dans le cadre prévu, viole, viole ou détourne un tiers valide brevet ou droit d'auteur existant à la date du présent Accord.Husky n'a aucune obligation au revendeur ou à toute autre partie à l'égard de toute action ou réclamation d'infraction sur la base de ou découlant de l'utilisation de tout produit, ou une partie de celui-ci si le produit a été utilisé: (i) dans un manière pour laquelle il n'a pas été conçu; (ii) sous une forme modifiée sans la permission écrite expresse de Husky; ou (iii) en combinaison avec tout autre système, équipement ou dispositifs non prévus par les spécifications des modèles applicables; ou si les produits ont été rénovées.Revendeur ne doit pas être droit à une indemnisation par Husky pour contrefaçon de produit à moins Revendeur: (i) donne Husky sans délai par écrit de toute action ou menace d'une action, le motif de cette action et toutes les réclamations antérieures relatives à toute réelle ou menacé d'une action; (ii) reconnaît par écrit que Husky aura le contrôle exclusif de la défense de l'action et toutes les négociations pour son règlement ou compromis et (iii) coopère pleinement et entièrement avec Husky à tous égards raisonnables (et aux frais et dépens de Husky) dans sa défense de l'action et toutes les négociations pour son règlement ou un compromis à des tiers.L'indemnisation de ce qui précède ne sont pas applicables à toute demande de brevet ou de droit d'auteur fondée sur l'utilisation de toute partie, composant ou un autre dispositif meublé ou fourni par le Revendeur. Si un produit, ou une partie de celui-ci, fourni par Husky ci-dessous, devient, ou de l'avis de Husky est susceptible de devenir, l'objet d'une réclamation pour contrefaçon d'un des États-Unis ou de brevet à l'étranger, marque déposée ou copyright, revendeur doit permettre à Husky, dans à la seule charge de Husky (i) de procurer aux revendeurs le droit de continuer à utiliser et de vendre le produit à des clauses et conditions jugées satisfaisantes par Husky et le troisième prestataire de la partie, ou (ii) de remplacer ou de modifier le produit de sorte que la seule discrétion de Husky et il devient non-contrefaçon. Confidentialité.Dans le cadre de la relation d'affaires envisagée par le présent accord, chaque partie peut recevoir ou avoir accès à des informations ayant une valeur commerciale technique et non technique confidentielles ou propriétaires de l'autre partie, y compris les informations, sous quelque forme, relatifs à l'activité de cette partie qui est pas généralement connu ou disponible pour les autres, y compris de nouveaux styles de produits et modèles, les secrets commerciaux, les stratégies de tarification, le marketing, les plans d'affaires et des logins et mots de passe fournis par Husky (le «Informations Confidentielles»). Chaque partie reconnaît et accepte que les informations confidentielles reçues ou obtenues auprès de l'autre partie sera la propriété exclusive de l'autre partie et ne peut être utilisé, diffusé ou communiqué sauf dans la mesure nécessaire pour exécuter les obligations requises en vertu du présent Accord ou qui peuvent être requis par la loi. Si la divulgation est requise par la loi, la partie tenue de divulguer des informations confidentielles sont raisonnablement coopérer avec l'autre partie (à la demande de l'autre partie et dépens) de telle sorte que l'autre partie peut préserver la confidentialité de l'information confidentielle. Nonobstant ce qui précède, les informations confidentielles ne doivent pas comprendre, et aucune partie ne sera responsable de la divulgation de toute information reçue par la partie qui reçoit en vertu du présent Accord, si l'information: (a) est ou devient généralement disponible pour ou connue du public sans acte illicite de la partie destinataire; (b) a déjà connu par la partie réceptrice par aucun acte illicite de la partie destinataire; (c) a été développé indépendamment par la partie réceptrice sans référence à l'information confidentielle; ou (d) a été licitement divulguée à la partie réceptrice par un tiers sous aucune obligation de confidentialité à l'autre partie. Cet accord ne doit pas être transféré ou cédé par le Revendeur, en tout ou en partie, ni ne Revendeur délégué ou sous-licencier aucun de ses droits ou obligations en vertu des présentes sans le consentement écrit préalable de Husky.Tout changement dans la propriété du revendeur que ce soit par la vente de ses actions, une fusion, une réorganisation ou la vente de ses actifs, en une seule transaction ou une série de transactions connexes, est réputé être un transfert donnant droit à Husky de résilier le présent Contrat sans préavis. Remèdes.Parce que les dommages associés à toute violation de cet accord serait difficile, voire impossible, de déterminer, Husky a le droit de demander une injonction immédiate (y compris mais non limité à une ordonnance d'interdiction temporaire, une injonction préliminaire et / ou permanente) contre revendeur pour une telle violation sans avoir à donner un préavis de revendeur ou de déposer une caution. Le droit de Husky à une injonction doit être en sus et non en remplacement de son droit d'obtenir tout autre dommage. Revendeur renonce à son droit à une injonction lui permettre de continuer le marketing, la publicité, la mise en vente, et / ou la vente de produits ou d'utiliser la licence IP une fois que cette convention a été résiliée pour une raison quelconque. En cas de non-paiement par le Revendeur, le revendeur est responsable pour les frais et coûts associés à toute poursuite ou toute autre action nécessaire pour obtenir le paiement complet de les avocats de Husky. Nonobstant toute disposition législative contraire, le revendeur doit apporter toute réclamation présumés contre Husky découlant du présent Accord ou sa résiliation dans les cent quatre-vingts (180) jours de la réclamation résultant ou une telle réclamation doit être levée. Clause inefficacité.Si une disposition du présent Accord est ou devient inefficace, l'efficacité de tous les autres termes de ce fait ne doit pas être affectée. Conditions inefficaces seront remplacées par des dispositions juridiquement valables, qui reflètent le mieux l'intention commerciale requise des parties. Légendes.Titres ou légendes contenues dans le présent Accord sont insérés seulement pour la référence commode, et ne définissent, limitent ou décrivent la portée ou l'intention du présent Accord ou de toute disposition des présentes. Entités indépendantes; Aucune Franchise relation.Aucune disposition des présentes ne doit affecter, modifier ou changer le fait que Husky et revendeurs sont des entités juridiques distinctes et ne sont pas représentants ou agents de l'autre. Revendeur reconnaît spécifiquement que le présent accord ne crée aucune relation d'agence ou de franchise et qu'aucune taxe directe ou indirecte a été payé par les revendeurs dans le cadre de la mise en place de cet acheteur / vendeur relation. Le présent accord ne crée pas une joint-venture, de partenariat et / ou d'agence. Husky supporte aucune responsabilité, directement ou indirectement, pour les emplacements de vente au détail ou pour les transactions effectuées par le biais desdits emplacements de vente au détail. Limitations de presse et sur ? ?les réclamations futures.En contrepartie de l'exécution mutuelle du présent Accord, le Revendeur accepte de libérer les présentes Husky de toutes sortes de mesures et d'actions, la cause et les causes d'action, poursuites, des contrats, des controverses, des dommages-intérêts, réclamations et demandes que ce soit, connu ou inconnu, en droit ou en équité, que ce soit en vertu des lois et règlements des gouvernements fédéraux, provinciaux ou municipaux, en vertu de la common law ou autrement, qui revendeur ou de ses ayants droit ou ayants jamais eu, maintenant ou qu'ils ou aucun d'entre eux ci-après peut, doit ou peut respectifs avoir contre Husky en raison d'une question, la cause ou chose quelconque depuis le début du temps jusqu'à la date effective des présentes. Les sections suivantes du présent Accord subsisteront après l'expiration et la résiliation du présent Accord; 3 (a), 4 (a), 5, 9, 11, 17, 18 et 19. Avis vertu du présent Accord se fera par écrit et sera réputé donné le jour de toute transmission de courriel ou trois (3) jours après l'envoi. Cette convention peut être signée en plusieurs exemplaires, dont chacun doit être considéré comme un original, mais qui tous constituent un seul et même instrument. Force Majeure.Ni Husky ni revendeur doivent être tenus responsables ou, à défaut pour l'échec de la performance pour toute cause hors de leur contrôle raisonnable telle que, par exemple, les actes de Dieu, guerre déclarée ou non, incendie, inondation, interruption des transports, de l'embargo, les insurrections, d'un accident , explosion, les commandes gouvernementales, les règlements, les restrictions, les priorités ou le rationnement, toute grève, lock-out ou d'autres conflits de travail interférant avec la production ou le transport de la fourniture de matières premières pour la production de produits Les produits ou les interférences. Si la force majeure en question prévaut pendant une période continue de plus de trois (3) mois, chaque partie a le droit de donner un avis écrit à l'autre partie de résilier le présent Accord, en précisant la date de résiliation, qui ne doit pas être inférieure à quinze (15) jours après la date à laquelle l'avis de résiliation est donné. Une fois l'avis de résiliation a été valablement donné, cet accord prend fin à la date de résiliation précisée dans l'avis. Les parties confirment qu'il est leur souhait que le présent accord ainsi que tous les autres documents s'y rapportant, y compris les avis, ont été et doivent être rédigés dans la langue anglaise seulement. Les partis présente aux concertent ment Leur Volonté Que this convention de same Que Tous les documents, y COMPRIS Tous avis, S'y rattachent, Soient rédigés en anglais seulement. Exécution électronique.Conformément à la protection fédérale des renseignements personnels et les documents électroniques, LC 2000, c. 5 («LPRPDE»), Loi concernant le cadre juridique des technologies de l'information LRQ, chapitre C-1.1 (la «Loi du Québec») et l'adoption de la Loi canadienne uniforme sur le commerce électronique ("LUCE") de chaque province applicable, les parties conviennent d'exécuter le présent Accord en utilisant des moyens électroniques, y compris l'utilisation des signatures électroniques par les parties, que les parties conviennent aura le plein effet juridique que si les signatures électroniques étaient signatures manuscrites traditionnelles. Concessionnaire reconnaît qu'il a la capacité de conserver le présent Accord soit en imprimant ou de l'enregistrer. Comme un Husky revendeur agréé, vous pourrez bénéficier de la notoriété et la valeur inhérente signifié par le nom de marque Husky et nos différentes marques de produits. En plus d'être sous accord pour utiliser les marques Husky correctement, il est dans votre meilleur intérêt à aider à protéger les marques Husky en les utilisant correctement dans tous les documents publicitaires et promotionnels. Revendeur ne doit pas utiliser ou enregistrer tout nom de domaine Internet contenant toute propriété intellectuelle, et soumet à Husky pour approbation à l'avance des copies conformes et complètes de toutes les pages du Monde Wide Web qui contiennent ou réfèrent à toute la propriété intellectuelle détenue par Husky et ne doit pas utiliser cette propriété intellectuelle sur son site internet sans cette approbation préalable. Revendeur ne doit pas, sans l'autorisation expresse écrite de Husky acheter la propriété intellectuelle de Husky par Google et les programmes Adwords de Yahoo et / ou des programmes similaires d'autres fournisseurs de services Web. Les marques doivent être reproduits exactement de la caméra illustrations prêtes fourni par Husky. Si le logo apparaît sur ? ?Husky papeterie ou les cartes de visite du Revendeur, les mots «Revendeur Agréé" doit suivre.Ceci peut être accompli en utilisant l'œuvre d'art "Husky Revendeur Agréé" fourni par Husky. Il ne faut pas confondre avec l'entité qui le client a affaire.Le nom du revendeur doit être le nom le plus visible sur la page. Le logo Husky peut ne pas être le seul identificateur de source sur la page. Le logo de la marque Husky peut ne pas apparaître en haut de la page. Le logo de la marque Husky ne doit pas être utilisé en combinaison avec une autre marque de l'entreprise d'une manière telle que les marques semblent être rejoint ou associée en aucune façon.Vaste espace doit apparaître entre les deux marques pour les distinguer comme des entités distinctes. Le logo de la marque Husky ou tout produit marque Husky ne peuvent être utilisés d'une manière qui va diluer ou diminuer sa valeur à Husky, comme sur les biens d'autrui ou de toute forme non-approuvé. Toute utilisation d'une marque Husky, sur une page Web doit se conformer à ces directives. Un exposant indiquant un symbole marque déposée (®) ou une marque commerciale (™) ou marque de service (SM) doit apparaître à côté de toutes les marques de toute la littérature imprimée. La marque déposée (®) ou une marque commerciale (™) ou marque de service (SM) symbole doit apparaître comme un exposant suivant la marque appropriée sur la première utilisation le plus visible sur chaque page d'un morceau.Toutes les marques doivent être capitalisés, en italique, en gras ou autrement ou traités avec la proéminence. Toute utilisation d'une marque Husky qui ne sont pas abordées dans les lignes directrices énoncées dans les présentes, doit être approuvé par Husky avant son utilisation.Documents à soumettre pour approbation doivent être envoyés à l'attention de votre représentant Husky. For complete program details, please download the Authorized Dealer Program. If you're already a registered dealer login here. What best describes your facility? How did you find out about the Husky Liner Dealer Program? What company is your primary supplier for Husky Liner products? Are you a Warehouse Distributor (WD) or a Jobber? Does your facility offer installation service? Are you selling Husky Liners products currently?